Audio over IP decoder with built-in 2x25W amplifier, S/PDIF output, USB flash interface and IR receiver, multi-format (MP3/WMA/AACplusV2, PCM,Ethersound) support. 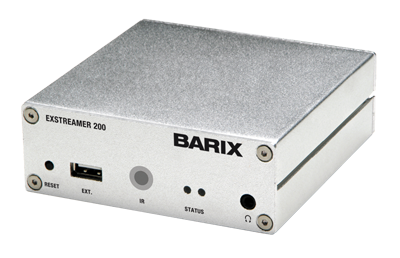 The Exstreamer 200 IP Audio Decoder decodes and plays multi-protocol and multi format audio streams, including MP3, AACplusV2, WMA, PCM, G.711, Ethersound. The integrated stereo amplified delivers 2 x 25 watt audio into 8-ohm speakers. 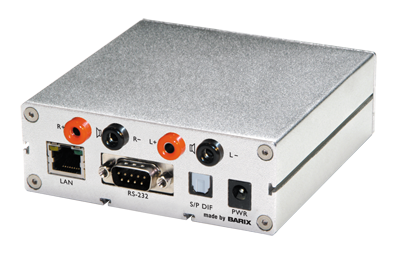 In addition, an S/PDIF digital output and headphone jack are available. Volume and channel can be controlled with the provided IR remote control and built-in IR receiver.